A nuclear research reactor was a possible target for a group of men arrested on terrorism charges last week in Australia, police have said. 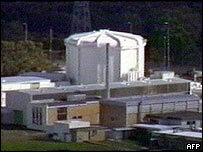 Three of the 18 men arrested had been stopped near the reactor outside Sydney last December, a police document said. Police also alleged that some of the men attended military-style training camps in the country's outback. Defence lawyers say there is no evidence of a planned attack and the case is politically motivated. The details of the police case against the men emerged as authorities in Brisbane ordered all trains and buses to stop during Monday's rush hour, following telephoned threats. Public transport was halted between 1645 (0645GMT) and 1715, but later resumed without incident after the calls were assumed to have been hoaxes. The 18 suspects were detained after raids in Melbourne and Sydney last Tuesday. The Sydney group was charged with planning an attack on an unspecified target, while the Melbourne suspects were charged with belonging to a terrorist organisation. A police document released on Monday named those stopped by New South Wales police near the Lucas Heights reactor as Mazen Touma, Mohammed Elomar and Abdul Rakib Hasan. Lucas Heights, Australia's only nuclear reactor, is about 40km (25 miles) south west of central Sydney. It is used for research and medical purposes, and does not generate electricity. The three told officers that they were in the area to ride a trail bicycle, which was in the back of their vehicle, according to the document. But when questioned separately, it added, the men gave differing accounts of their activities. After investigating the area, police found a security gate lock for the complex "had recently been cut," the document said. The document also said six of the men arrested went on "hunting and camping trips" in early 2005, which police described as jihad training camps. The document said the Sydney group was gathering material to make a bomb. It said a computer memory stick had been found at one of the suspect's houses which contained instructions in Arabic for making triacetone triperoxide (TATP), an explosive. The document said police had seized 30 bottles of hydrogen peroxide and six gallons of hydrochloric acid, among other materials. A defence lawyer said the charges were based on "marginal evidence".